Doing a lot of SEO reporting for my clients at Tim B Design, I’ve found some surefire ways to keep their attention on the results of our SEO engagement – and to make sure they understand what’s going on. Reporting with Google Data Studio has been an absolute game changer in being transparent and showing revenue and estimated revenue from traffic and leads in a dynamic, compelling way. I was always interested in doing this math before when I was getting into SEO – but I didn’t know that my dream was really possible. With the client along for the ride, I figure out what their average customer lifetime value is – and then get the lead to close ratio for a certain period of time, in this case we used May and June. Once we have those elements we can do some math based on the conversions that are taking place if we have Google Analytics conversions set up! It’s extraordinary! Here’s the example based on the math the client shared with me about what leads are worth to them multiplied by the number of conversions. As you can see – for this client each inbound organic lead will be worth on average of $1,567. So now we can demonstrate the net positive effect of more organic traffic through the power of quantifying what a lead is worth and dynamically doing the math for what all those leads and the increase of them is worth. This helps justify the expense of effort on SEO. My second favorite thing about reporting on Google Data Studio: Demonstrating top keywords and talking about why your efforts are going to certain ones. As you can see from this list, there are some giant opportunities to get more clicks – if there are 1,000 Impressions at spot 6 or 17, then imagine what spots 1,2,3, or 4 could do for the traffic on that particular term. I love including this data pulled from Search Console in a way the client can see and really understand why we might be going after particular topics or earning links to particular pages that are ranked for these terms and paying close attention to anchor text for our absolute best links. Nothing beats pure E-commerce revenue from organic traffic. 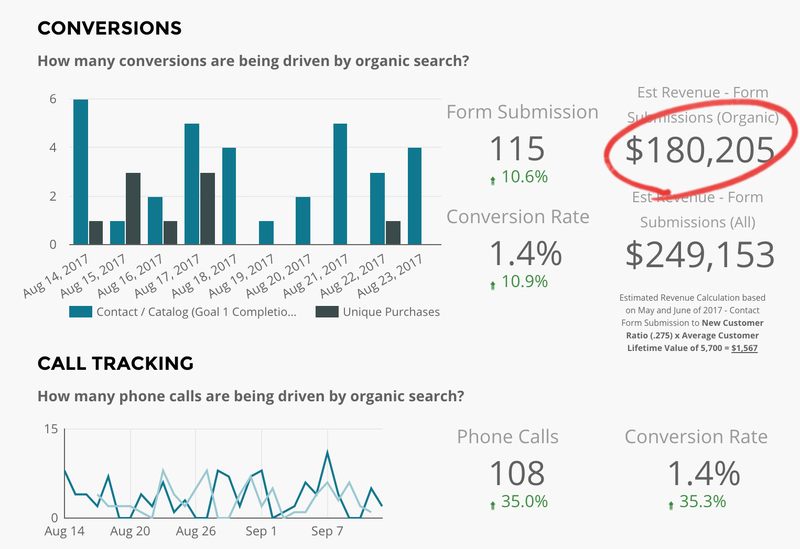 In the case of one of my clients, they do both lead generation and E-commerce, and with Google Data Studio I can show estimated revenue from leads right next to good old fashion money in the pocket. Google Data Studio is like Word or Google Docs with the ability to connect Analytics, and Search Console Data and does any equations of filtering that you might need to. I may slip in a screenshot from SEO Tool Ahrefs for good measure, like for referring domains to show your link-building efforts, or for Organic Keywords to show the rise of keywords ranked over time. It may seem silly, but some of the features I love most about Google Data Studio are actually the simplest – at the top of each of my client reports I go through my activities for the month and the steps I’m taking for their website for the next month. I put them in columns side by side, and this ability to add text however you need next to live data and graphs creates a cohesive impression and allows you to have consolidated reporting. If you want to add your goals for the month on conversions or traffic, you can, right next to live actual numbers! Don’t get into reporting with Google Data Studio if you don’t want to hold yourself accountable for the reality of the client’s SEO situation. Even though it’s challenging, I enjoy sharing information this way. I believe many SEO specialists will move to some variation on this style of reporting because of its flexibility and its openness compared to many SEO reporting tools that don’t allow a lot of customization or are a bit more regimented in the style and layout of the numbers and data. Good luck with your reporting efforts – and check out Google Data Studio if you haven’t yet! Tim Brown is a web designer and SEO Specialist who runs a small agency Tim B Design – and loves helping small to mid-size businesses with their website design and SEO. You can tweet him @timbdesignmpls.